In the close of yesterday’s review which recounted the other side of saxophonist Tom Archia’s debut on Aristocrat Records, we made a comment about what should be seen as “average” and though the reference was a little off-color it fit because so was the record itself. But it also raises a point that I’ve been hoping is clear to those who come along and read these reviews and start applying their own grades to them and that is: What exactly IS average? What Makes You Do The Way You Do? Average = Typical. Common. Ordinary. Mediocre. Are those compliments, criticisms, both or neither? And are they ever accurately applied, particularly by reviewers, professional or amateur? Well, I suppose it depends on just where you look. If you were to go to say… Amazon (and by the way if you do, try and use the links we have here in the form of album covers!!! – end of shameless affiliate plug) and as you gaze over their reviews which are graded by customers on a 1-5 scale you’ll see that the average score for most products is never average. In other words a three would be what you’d expect MOST items to get if the grading system was being adhered to but obviously that’s never the case. In fact if something had even a 3.5 rating after a dozen or so reviews it’s entirely likely that it would be passed over en masse by those looking for something under that product heading, even though 3.5 stars in a five star system is technically ABOVE average. But people just don’t grade that way. It usually seems that when it comes to assigning grades most people start with a perfect score and mark down only if something was seriously flawed. Say if all the wheels fell off a lawnmower while you cut the grass for the first time, a coffee maker somehow produced iced tea or a child’s stuffed alligator toy wound up eating their child… and because of THAT we have to give it just FOUR stars! The products that DO wind up averaging 3’s usually do so only because half the people who bought it are considering filing lawsuits against the manufacturer, all while the other half of the reviewers enthusiastically say, “It arrived on time!” and give it five stars for prompt delivery alone and therefore it all balances out. In other words the average score is almost NEVER for an average product. A product that simply works as advertised, doesn’t fall apart and is perfectly acceptable without doing anything to earn undue praise or undying gratitude for merely being created. Why aren’t there more of those? Why don’t those reviews dominate the pages and therefore leave the above average grades for those products which are (drum roll please…) above average!? Here on Spontaneous Lunacy I wanted to avoid that type of all or nothing mindset that plagues so many graded review sites. I specifically wanted to ensure that just because a listener has an acknowledged fondness for a particular musical approach (or era, style, artist, etc.) they’re not grading on a curve, indiscriminately issuing 7’s for any record that’s moderately agreeable while handing out 9’s and 10’s like tic-tacs on a long car ride with a pack of restless 4 year olds. So while the Scoring System is clearly spelled out for everyone to use as a reference, it still brings us back to the question of just what IS average? What does a record that’s average actually sound like? Are its flaws glaringly obvious? Does it have anything to recommend it? Is it something you’ll turn up? Is it something you’ll turn off? Is it even worth the bother to review it in the first place? Just who wants to even read about the bland mediocrity of “average”? Well, hopefully at the very least everybody who showed up here (sorry to spoil the suspense). Though this song was cut on the same day, by the same musicians and is credited to the same artist – Tom Archia – as the side we covered yesterday, the ribald sexual lesson Fishin’ Pole, that doesn’t mean we don’t have additional introductions to make here. Notably the two songs were sung by different vocalists… of different genders… and neither one was Tom Archia! The vocalist here is Sheba Griffin – and just an aside, but with so many newborn girls seeming to get stuck with the same dozen or so names these days, why is a name as captivating as SHEBA going unclaimed?!?!?!?!? But I digress – who acquits herself quite well on this bluesy torch rock lament. Mean And Evil Baby is a song that calls for no heavy lifting on Griffin’s part yet requires her to hit the right mood throughout, that of a girl who’s been used by her lay-about boyfriend who’s living off her paycheck without any deeper sign of emotional commitment on his part. She’s finally come to the realization that he’s no good and this is her way of confronting him about his behavior, yet even as she does so she still holds no power over him as her sad worn-down delivery makes abundantly clear. Though it may in fact be her fault for letting him take advantage of her in the first place rather than begin the whole affair with more self-assurance, the fact that she admits this now and seems to be blaming herself for being duped gives it the added gravitas needed to work as well as it does. Her emotional despondency is the record’s strongest asset, the weary tinge to her voice makes her sympathetic rather than simply pathetic. It’s sad to contemplate how many girls, then and now, both on record and in real life, get into these situations and stick with the ensuing relationships long past the expiration date simply for the tenuous security of having someone to call their own, only to find out in the end that the bonds weren’t based on anything more than a rent check or a warm bed, certainly nothing meaningful and lasting. Griffin inhabits that role as if she’s speaking from experience which is both heartbreaking and sadly necessary, for the rest of the song couldn’t hold up without her personal credibility as an actress playing this role. The fact she’s credited in a secondary nature on the label is almost an added cruelty in a way, as if she’s dealing with the same lack of respect as an artist as her character is within the song itself, even though it was probably only circumstantial. As for the ones who get the featured spot on the marquee as it were, Archia and his All-Stars, they start things off well with a elegiac horn-led intro that puts us in the right frame of mind for what follows, conveying the melancholy mood perfectly before Griffin’s appearance heightens the effect. The music that backs her after this however alternately sounds lackadaisical and disinterested, although not necessarily with the tune itself, but rather they seem to be playing a part too, almost sneering at the girl who is spilling her guts to the world about this sham of a romance that she still can’t pull herself free from. The piano offers a few chuckles at her expense as she drags herself in from the cold but doesn’t offer her a warm drink to make her feel better. The horns moan in response to her claims, either tired of hearing her complaints and thus mocking her for the amusement of others, or just serving up crocodile tears to get her back out the door so they don’t have to listen to her whine about her no good man that she’s probably complained about before without doing anything about it then either. If that’s indeed their intent all along they do so rather effectively I suppose but somehow I don’t think it was thought out quite deeply as that. Rather it’s more like they chose the easiest method to match the sentiments which meant laying back, wandering around the melody a bit aimlessly, sluggishly even, and not doing anything to overwhelm her, but neither are they doing much to support her and emphasize the pain she’s feeling. Yet it still works okay, even if it doesn’t give Griffin much room to emote beyond the mournful tone of her grievances. There’s no sudden shifts to capture our focus and no gut-wrenching solos to draw attention to her misery, nothing really to elevate our sympathies for her. She has to work hard for every response she’s aiming for, yet to be fair they never abandon her musically either, never leave her completely on her own to pour her heart out in the darkness while they slip into a bar for a drink. It retains its fundamental despondency to the bitter end. Neither the musicians nor vocalist really take a wrong step along the way with this, which we’ve seen happen a few times already in our first two dozen reviews, in some cases sinking an otherwise good effort by the other half of the equation. Both parties adhere to the basic approach these types of records subsist on, carefully judging their steps and staying within marked lanes and for that you can commend them. But you could also criticize them for their lack of overall ambition, for at no point do either the band or Griffin strive to really make their mark on the record, to leave a deeper imprint on the listener’s psyche than simply what’s offered on the surface. Both of those are fair depictions of the record’s attributes even if they appear somewhat contradictory by nature. The storyline is believable, Griffin is convincing, the band is proficient. Check, check and check. They do enough to make it work, but that’s all. It’s just good enough. But as human beings that tends not to be good enough when handing out grades, does it? For a society whose history is otherwise riddled with deep seated prejudices of all kinds, who go to great lengths to divide the populace into simplistic compartments of “us” and “them”, and then enact laws to favor “us” and deprive “them”, and who probably all lie, cheat and steal with casual disregard for others at some point in their lives… these very same people are almost afraid to appear too harsh when grading the work of those who are selling them something, music or microwaves it hardly matters. That’s when human beings will suddenly strain to see every rainbow behind the dark clouds, to go out of their way to offer up insincere praise so someone’s feelings aren’t hurt and to downplay any honest reservations about the results until the mere inference of “average” becomes a harsh and unfair stigma. Mean And Evil Baby is a pretty standard, by-the-numbers, emotionally wrenching song of love gone bad. Within that definition you can shade it differently, “run-of-the-mill” if you’re feeling a little snide, “pretty decent” if you’re a bit more charitable. Yet all of those mean essentially the same thing… and that’s the point. They’re average. Good enough to be heard, not quite good enough to be sought out. But considering all of the records made throughout rock’s history, millions of them by this point in time, even just in this style alone over the years there must tens of thousands that fit this basic description, when you really sit down and think of it to be considered “average” in that pursuit is really nothing to be ashamed of at all. 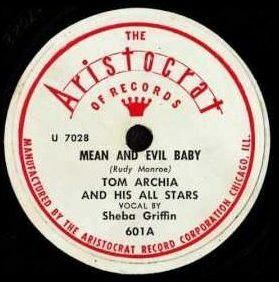 Leave a reply on "Tom Archia & His All-Stars: “Mean And Evil Baby”"